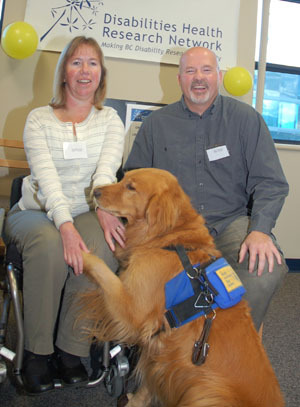 Dr. Bonnie Sawatzky and Dr. Lawrence Berg, co-leaders of the new Disabilities Health Research Network (DHRN), and Sawatzky’s service dog Phoenix, were on hand for Friday's official launch of the DHRN at UBC Okanagan. The new Disabilities Health Research Network (DHRN) at UBC Okanagan is already doing what its creators hoped it would: it’s bringing researchers together. The DHRN’s co-leaders, Dr. Bonnie Sawatzky and Dr. Lawrence Berg, represent very different areas of disability research. Sawatzky is a wheelchair propulsion researcher and Assistant Professor at UBC’s Division of Orthopaedic Engineering and Paediatric Orthopaedics. Berg, Canada Research Chair in Human Rights, Diversity and Identity at UBC Okanagan, researches citizenship aspects of disability and disability rights. As a hub for B.C. researchers and community partners, the DHRN is intended to link researchers with people and organizations that serve people with disability. Through the DHRN, for example, graduate students can connect with organizations to study disabilities health issues that are driven by people with disability – ensuring that research is focused on areas of high priority. “We’ll be working hard doing what community organizations want us to provide – to have the research they believe is needed,” Berg noted. One of eight Health of Population research networks in B.C., the DHRN has received approximately $1 million from the Michael Smith Foundation for Health Research to foster high-quality research and community connections to better the lives of Canadians with disabilities. The DHRN is operated from the Community, Culture and Global Studies Unit at UBC Okanagan’s Irving K. Barber School of Arts and Sciences. A website has been created to provide information about the new Disabilities Health Research Network: http://www.dhrn.ca/.